Banpur is a town and a Notified Area Council in Khordha district in the state of Odisha, India.The town is named after the King Banasura of Lord Krishna age. Banasura, a demon-king who is said to have ruled over this place. The place was under the control of a line of feudal lords, the ancestors of the Rajas of Parikud, till 18th century. Major point of attraction here is the temple dedicated to Goddess Bhagabati, the presiding deity of Banpur. It is one of the famous Shaktipithas of Odisha. As per historical importance it was one of the centers of inception of Paik rebellion. Banpur is located at 19.78°N 85.18°E﻿ / 19.78; 85.18. It has an average elevation of 1 metres (3 feet). As of 2001 India census, Banpur had a population of 25,652. Males constitute 51% of the population and females 49%. Banpur has an average literacy rate of 69%, higher than the national average of 59.5%; with 56% of the males and 44% of females literate. 13% of the population is under 6 years of age. As the town is situated in the coastal area there you cannot feel too hot in summer or too cold in winter. The rain fall is sound and suitable for agriculture. The town is enriched with cultural heritage and is famous for its unique cane made art-crafts such as sofa set,hanging chair, TV stand etc. The ancient Daksheswar or Dakshya Prajapati Temple situated at the entrance of town features fine specimens of Oriya architecture and sculpture. As in Oriya proverb bara masa tera parva 13 festival in 12 months. Here in Banpur you can find such culture also.Among all the festivals the most famous one is panchudola-the 5th day after holi/dola purnima, where you can find the gathering of 72 god and goddess in a large ground. This festival is carried out for 2–3 days. Banpur has a great history of its Religion, Art and Culture. The Nehru Seva Sangh came into existence in 1946 By Swami Harihar Ram, when India was on the threshold of independence. It is situated At Banpur on the banks of Chilka lake, about 100 km south of Bhubaneshwar, the state capital of Odisha. The Sangh has many activities like- orphanages, schools and training centers for blind, deaf and Women's, welfare of scheduled castes and Hostel fir s.tribes etc. It has schools for both blind and deaf as well as general students. Industrial training center for women on tailoring, And Cane, willow and Stenography for men & women running. Padma Charan High School, Alaidiha, Banpur. Panchupalli Somanath High School, Brahmankushadiha. Girls' High School (govt), Banpur(NAC). Nachuni Godavarish High School. Nachuni. There is also the scope of higher education in general studies like Bachelor and Master in Humanities as well as in Science and only Bachelor in Commerce. Rabindra Kumar Dash, Noted Educationist & Social Worker, Retd.Teacher Nachuni Godavarish High School. Famous for the time honoured temple of Goddess Bhagabati, Banpur has earned celebrity as a center of religious activities. Once it was the capital of Sailodvaba dynasty, responsible for the construction of the early group of temples in Bhubaneswar. The large number of Buddhist images discovered at Banpur relate the place to the Vajrayan cult of Buddhism. The temple of "Dakshya Prajapati" is a fine specimen of extraordinary artistic excellence of Odishan art.Banpur is also famous for its cane products. it plays one of the most important role in odiya history. It was an important centre of shaivism,shaktism and buddhism. Lord Jagganath was housed in Bankada gad fort at Banpur for 30 yers.The town is in scenic and sublime surroundings.It is surrounded from 3 types by huge hills led by GHANTASILA and chilka on the 4th side. 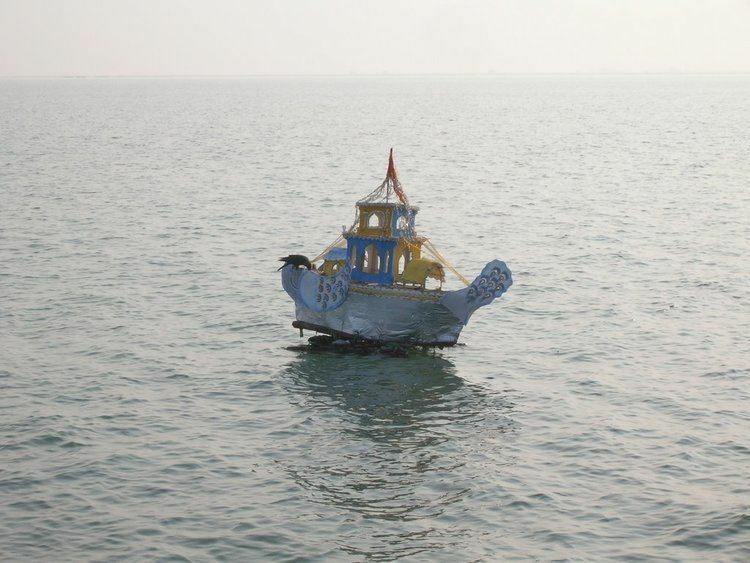 Chilika, the largest brackish water lake in Asia covering an area of over 1,100 square kilometres (420 sq mi) is a great attraction for the tourists for fishing, bird watching and boating. In winter, Chilika attracts thousands of indigenous and migratory birds. This is also place of attraction for the endearing specie Irrawaddy dolphin.